The Painting Center is pleased to present an exhibition of recent paintings by Galen Cheney, her first large show of paintings in New York City. The exhibition, titled Gut affirms and expands Cheney's longstanding investigation of the plasticity of paint, the thrills and limitations of abstraction, and the potential for paintings to be a site of experience for both painter and viewer. Cheney constructs these visceral, process-driven paintings from a dense, gestural application of paint, paper, and fluorescent sign-painting paint, approaching the process of painting architecturally. Painting "from her gut" Cheney alternately constructs the painting then guts it, only to build it up again.She calls her painting process "controlled demolition" reveling in the choreography of creation and destruction. There is great tension before that fuse is lit she writes, "but tremendous release and sense of possibility once the dust clears. 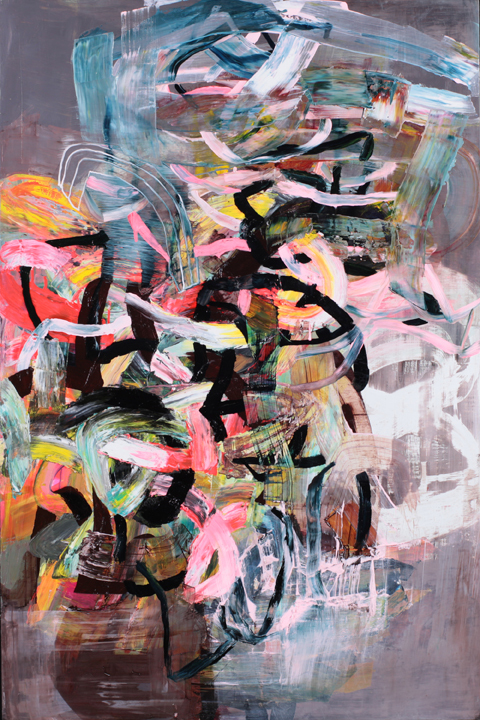 In their colorful complexity and visual immediacy, Cheney's works draw influence from Philip Guston's dense colorscapes from the 1950s and 60s, the gestural fluency of de Kooning's line, and the unctuous surfaces of Cecily Brown. In the fading industrialism of Chelsea, Cheney's works gesture towards the gritty sidewalk, the fluorescent flare of graffiti, and the vaunted masters of Abstract Expressionism. Galen Cheney received her BA from Mount Holyoke College and her MFA from the Maryland Institute, College of Art.Her recent exhibitions include Charged Brushes at The Painting Center, Contemporary voices of Vermont at The Fleming Museum, and Encoded, a solo show at Saint-Gaudens Memorial Historic Site.Her work can be seen online at www.galencheney.com.